A lucid, engaging “panoramic essay” about the artsy New York neighborhood now overrun by upscale shops and bohemian wannabes. New York’s SoHo, not to be confused with London’s similarly-named Soho neighborhood, is an acronym for South of Houston (pronounced HOW-stun) Street, a major east-west thoroughfare in lower Manhattan. The area’s first incarnation in the 1840s was as a fashionable shopping district, an identity to which it has recently returned; many of its ubiquitous cast-iron facades date from that period. A SoHo pioneer, Kostelanetz offers cogent and humorous observations on its famous and not-so-famous denizens, from composer Philip Glass to real-estate speculator and “founder” George Maciunas. He goes on to outline the melange of conditions that serendipitously engendered and then fostered this community of artists beginning in the early 1960s, when it was still an industrial slum “clogged with trucks and truckers.” The author recounts his own parallel history from uptown academic to downtown hipster, providing insights into the fortuitous circumstances that led to SoHo’s astonishing revival completely outside the more contrived large-scale efforts of urban renewal advocates. Kostelanetz offers several reasons for the neighborhood’s successful gentrification by artists, art-lovers, and the first gallery owners, among them the quantity of cheap commercial space, city tax abatements, and the relaxation of building codes that permitted artists to live legally in lofts. 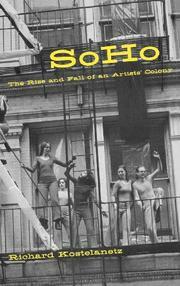 Beyond these sociological and economic underpinnings, however, he provides an array of anecdotes that convey the true flavor of SoHo during that era, from a course in freight-elevator etiquette to a description of mining Dumpsters for furniture and art supplies. By the 1990s, newcomers outnumbered veterans, and the artists and writers of SoHo, Kostelanetz among them, dispersed into the urban landscape. An uncommon guide and an enjoyable countercultural and personal history.